Riccardo Fortuna is a gifted artist, who has created un fumetto – a graphic novel – that brought tears to my eyes and an ache to my heart. Last summer, Riccardo presented this graphic novel at a forum on one of the most obscure and controversial pages of the Risorgimento – the massacre of Pontelandolfo and Casalduni citizens by the Royal Italian Army on August 14, 1861. When I heard him speak and picked up his recently published book – yes, yes, he is awfully good looking – but that wasn’t the reason I picked up his book – I couldn’t wait to read it. His novel, 14 Agosto 1861, tells the story of the horrific events that happened one night in the Italian villages of Pontelandolfo and Casalduni. 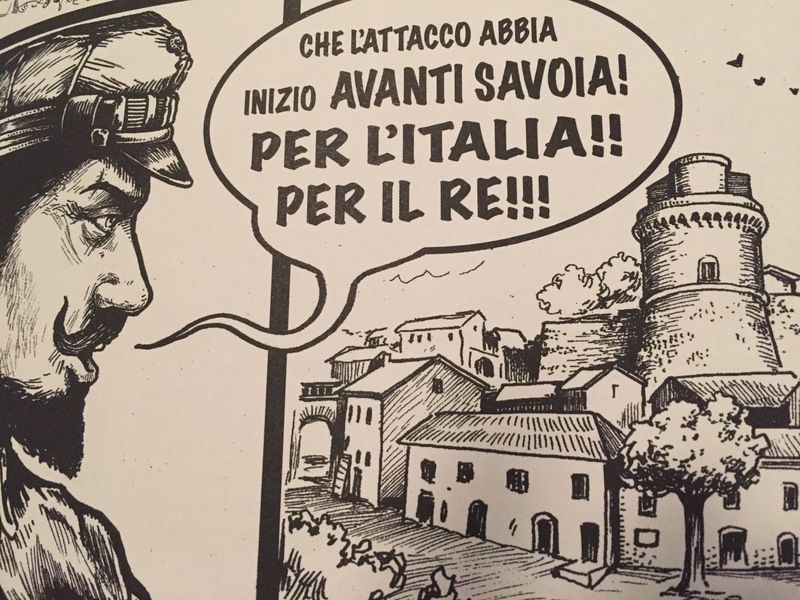 Not only did the incredible drawings and historic through-line resonate with my passion for Pontelandolfo but they also made me realize how little I knew – and I’m guessing most Americans know – about the militaristic march to unify Italy. Jack is an avid reader of history books. I start to read Italian history and wake up with the big books crushing my belly. Then, I read 14 Agosto 1861. Not only did I stay awake, but I could not put the book down until, with tears sliding down my cheeks, I finished it. Fortuna, having heard the story,researched the incident and created a history book with drawings that captured the spirit and pathos of one murderous night. On August 14, 1861, some partisans captured and killed a small number of Italian soldiers in Casalduni. Seeking revenge, Italian Colonel Pier Eleonoro Negri directed his men to launch an attack. As Pontelandolfese calmly slept, an indignant, Colonel Negri ordered that his soldiers destroy the community. Di Pontelandolfo e Casalduni non rimanga pietra su pietra. Leave no stone left standing in Pontelandofo or Casalduni, he cried. Entering Pontelandolfo in the middle of the night, the soldiers, kicked in doors, leaped up stairs, raced into homes killing men, women and children. Looting and unimaginable atrocities occurred. Flames soared and the village burned. The infamy of this night will never be forgotten. – can be found on amazon.com. I hope that there is a second printing of 14 Agosto 1861. Why not contact Riccardo and ask him! Previous postUSA Citizens Vote While Overseas!! Isn’t it amazing how much history we never learned in school? How beautifully written your post is! My heart raced while reading about the night of 14 Agosto 1861.